GeorgeWashington is a Legacy Library. Legacy libraries are the personal libraries of famous readers, entered by LibraryThing members from the Legacy Libraries group. 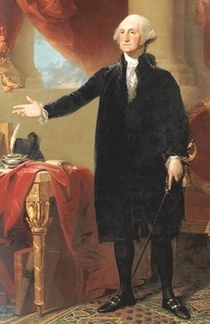 » George Washington's legacy profile. GeorgeWashington is also an author. » See George Washington's author page. About meGeorge Washington (22 February 1732 - 14 December 1799), Virginia surveyor, landowner, military leader and statesman. Commander of the Continental Army, president of the Constitutional Convention, and first president of the United States. About my libraryGeorge Washington's library at the time of his death ran to some nine hundred volumes, which passed into the possession of his nephew Judge Bushrod Washington along with Washington's papers and Mount Vernon. When Bushrod Washington died in 1826, he willed parts of the library to his nephews George C. and John A. Washington and to his grand-nephew Bushrod Washington Herbert. Around 1847, a large portion of the books which remained at Mount Vernon were sold to bookseller Henry Stevens, who announced his intention to send them to the British Museum. A group from Boston and Cambridge, MA responded by raising $4,250 and purchased the books for the Boston Athenaeum (along with items to accompany the collection). This collection comprises the major portion of George Washington's library as we know it today. Other Washington books were sold at auctions in 1876 and in the early 1890s. Information on the books sold in those sales has been included where possible. Annotations in the records are from the Boston Athenaeum or from other sources where noted. Locational Collections: Using the transcription of Washington's probate inventory (PDF), collections have been added indicating the bookcases (1-8) used by Washington for his books at Mt. Vernon (plus another location listed at "On the Table"). Within these collections, using the inventory numbers it is possible to recreate (roughly at least) the order of the books on Washington's shelves. Please note: The separation point between Cases 3-4 is not indicated in the inventory, so I have made an educated guess about where that break approximately occurs. Some items of which GW had more than one copy may appear in more than one locational collection. And for many bound volumes of pamphlets (Miscellanies, Political Tracts, &c.) it was not possible to identify specific volumes, so those have not been assigned to their respective cases.